What privatisation means: London Buses was split into 12 business units, in preparation for sell-off. In late 1994 the separate London Buses' business units were sold off to private ownership which also meant that the routes were tendered off to private operating companies to operate under a concession for London Transport. services would have been handed over from the governing body (London Transport or Public Transport Executive) to the private operating company. This means that it would have been down to the private operating company to form their own services and set their own fares and timetable. Ever since London Regional Transport was formed in 1984 by the British Government, they established London Underground Ltd. and London Buses Ltd. as subsidiary companies. The legislation also started off tendering routes to private operating companies to compete. The first route that went out to tender was route 81 (from Hounslow to Slough) which had been awarded to London Buslines in 1985, operating with their own yellow livery with orange and brown stripes. Then in October 1986, all of the bus operations in Britain (outside of London) were deregulated and privatised under the Transport Act 1985. The National Bus Company which was owned by the Department of Transport was privatised and divided into 70 separate legal entities and sold to private owners. The PTE (Public Transport Executive) bus operations were also affected under the plan. Ironically, Northern Ireland's bus services weren't affected by the privatisation and deregulation. Then during the late 1980’s, the percentage of London bus routes tendered off to private operators increased. One of the notable routes was route 24 (from Hampstead Heath to Pimlico) which had their operations tendered off to Grey Green in late 1988, operating with Alexander bodied Volvo Citybus operating with grey, green and orange stripe livery. The purpose of tendering off London Bus routes to private bus operating companies was to cut the operating costs in half, as the government claimed that publicly owned London Bus operations had become too expensive for them. Moving on to the early 1990’s, the British Government unveiled a new consultation paper which was called ‘A Bus Strategy for London’. The consultation had over 200 responses. The government believed that deregulation instead of centrally planned bus services in London would encourage a more varied service. They also claim that London Bus Deregulation would have the best chance of increasing bus patronage. They claimed that deregulation would bring greater freedom of choice to both the bus operator and passenger. It would give the operator an incentive to provide the services the public wants. The reason why they wanted deregulation to happen was because it was part of the 1992 Conservative party manifesto, for when they were elected back into power in 1992. What would replace London Bus tendered services? London Bus services could have become deregulated during the mid 1990’s; the London Bus Executive would have been formed to tender and fund socially necessary routes that are not profitable. They would have also been responsible for the bus stops/stands, bus stations and provision of information. The Secretary of State for Transport would have been appointing members for the London Bus Executive. The London Bus Executive would have been separate from London Transport as it would be a governing body of its own. The London Regional Passengers Committee (LRPC) statutory involvement with bus services in London would have ceased if deregulation had occurred. What would happen to concessionary travel including Travelcard? Their biggest concern about London Bus Deregulation was the concessionary travel. They claimed that there is no question of deregulation or privatisation leading to the demise of concessionary travel in London. Back in 1988, David Mitchell said in the Houses of Commons debate: On the question of deregulation, we have already said that a London-wide concessionary fare scheme will be protected in law. There is no reason why operators should not participate in multi-operator travel pass schemes. Another issue was about the Travelcard, the government claimed that the Travelcard would have continued under London Bus deregulation and would have ended up being limited to a selected operator that is willing to participate, but London Transport told the committee that deregulating the capital's buses would make administration of the card impossible as the new multitude of private operators would be unable to agree on sharing revenue. A leaked document from the Department of Transport said “The most likely scenario is that the existing Travelcard will disappear and it will be some years before operators are prepared to agree amongst themselves that some kind of successor is needed." 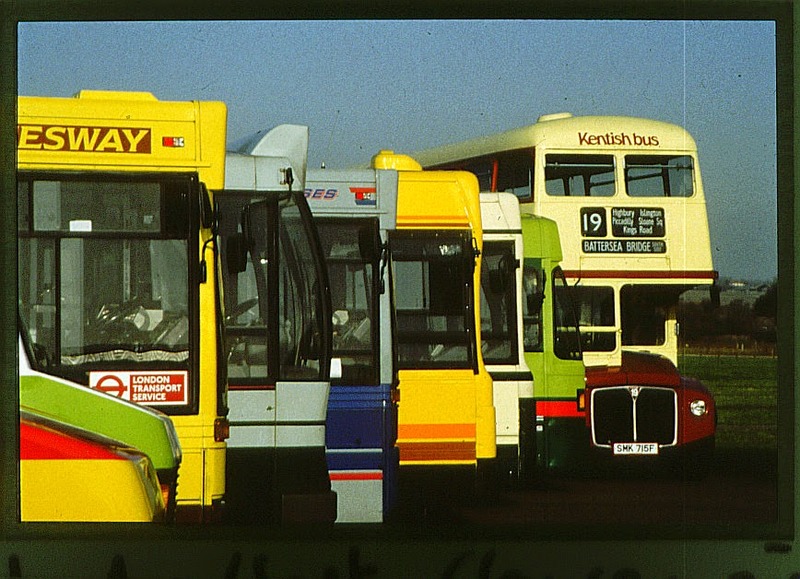 Then low and behold, a few months later (in 1993) the Travelcard was back on the agenda on London Bus deregulation. If it was to happen, the price for a Travelcard would increase to cover the costs for the individual bus operating company that operates bus services in London. Alan Watkins, London Transport's chief executive, told the Transport Select Committee in April that it would be impractical to operate the Travelcard after deregulation because it would mean agreements among 40 or more separate operators. Would the roads be congested if deregulation happened in London? Well, in reality, if deregulation of London Buses was to occur, the fact is it would cause serious congestion to London roads. The government claimed that deregulation would relieve congestion but in reality the congestion would be much worse. Worst of all would be the pollution coming from the diesel fumes of the buses. Take for example what happened to the town centre in Oxford back in late 1995 where people complained about the amount of buses in the town centre and the diesel fumes which were causing people to choke, especially those people with asthma. Another thing to consider is that a bus war would have broken out between bus operating companies. The operators would have used unfair practises like extra unscheduled buses to collect passengers from its competitor. Two years ago for example, two operating companies clashed in the East Midlands, Trent Barton and Yourbus. Trent Barton which operated the route parallel to Yourbus company gave free breakfast in order to gain passengers. Back in 1987, ITV Franchise TVS (Television South) produced a ‘Bus Wars’ report on their Facing South programme, they reported on the 'bus deregulation' in the South of England where bus wars had broken out. You can see the programme in full, here. The reason why bus wars had broken out was because private deregulated operators wanted to make more money by collecting extra passengers. What bus operating companies are in favour of deregulation of London Bus services? Many bus operators, including subsidiaries of London Buses Ltd., expressed concern over the deregulation and privatisation of London Bus services. It shows that management of London Buses did support the privatisation and deregulation of London Buses which was quite unusual for a publicly owned operating service to support something like bus deregulation that the majority of Londoners were against. Bus operator Grey Green opposed deregulation of London Bus services, the managing director of Grey Green, John Pycroft said “I don't think either the industry or passengers will benefit from unfettered competition. Outside London, you can't even get a combined bus timetable because operators are not keen to advertise each other's services. Usage will undoubtedly decline.” He prefers continuation of the competitive tendering system and strongly disagrees with privatisation after deregulation. Grey Green also said "free-for-all which will be detrimental to the public". Peter Hendy, the managing director of Centrewest, a subsidiary of London Buses Ltd. stated that given the Government's stated policy, he prefers deregulation to the method already employed to implement "market forces" in the London bus industry. He said “operators will be able to plan services and routings themselves; cash fares and Travelcards will increase in real terms; on being questioned whether Travelcards would survive, maybe only bus passes would survive; LBL were investigating ways of retaining bus passes.” He also said “tendering had probably reached its ‘natural limit’. Would the deregulated buses in London remain red? So this means that buses operating on London Buses tendered routes can have their own liveries which mean the buses can be in any colour. One of the notable tendered routes in Central London with non-red buses is route 24 with Grey Green livery, and route 176 with London & Country Green livery. 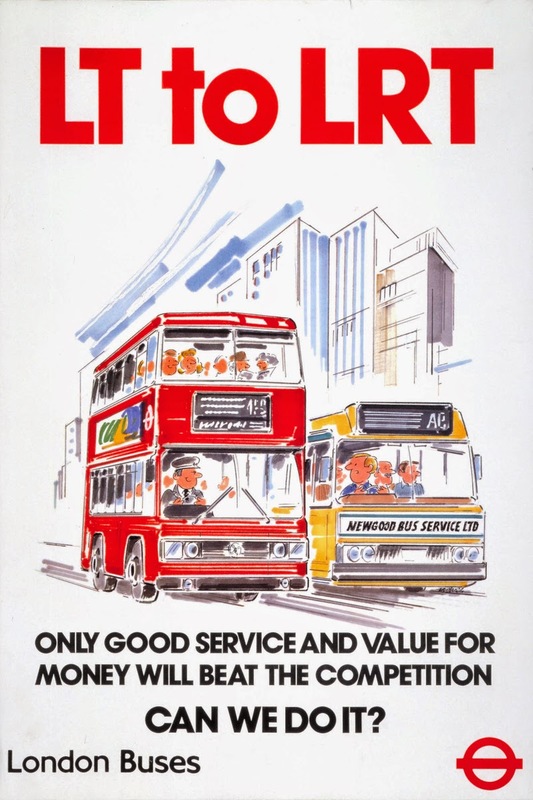 Most notably, Stagecoach bought East London and Selkent from London Buses Ltd. They retained the all red livery on their existing buses. In reality, newly tendered routes in the Central London area had to be 80% red which came in to force in 1997 after lobbying from the tourist board. Following this, the rest of the bus services in Greater London started to be 80% red in early 2000. Then in 2011 all new buses had to be 100% red with the London Buses roundel on the side. This shows that London Buses have been regulating over the livery of the buses that operate on London Buses tendered routes. What does the government claim regarding the advantages of London Bus deregulation? I'll paste some quotes from various Members of Parliament who expressed their positive thoughts towards deregulation of London Buses. Malcolm Rifkind said on July 22 1991, in a House of Commons Debate, "The Government believe that deregulation will bring greater freedom of choice to both bus operator and passenger. Operators will have an incentive to provide the services the public wants. The operating environment will ensure that no one operator has an unfair advantage over another. The passenger will benefit from an increased number and variety of services. And there will be safeguards to ensure the provision of socially necessary services, and of adequate bus facilities." This means that the operator has to invest more for services from their own profits. Extra routes means more traffic congestion, increased traffic means more pollution and this is bad for the environment and peoples' health. Usually the local authorities introduce new services because deregulated operating companies tend to make new services against the competing operating company. Disruption of services? It could happen with the amount of deregulated buses operating on one road which means the increase of congestion which is a cause of disruption. Especially with the incidents of ‘bus wars’ which occurred with the bus firms outside Greater London. If bus deregulation had of happened in London, we would have seen a different atmosphere with the bus services in London. · The iBus which displays the names and announces the bus stops. · Cashless buses where you can only use a Paper Travelcard, Oyster and Contactless bank cards to use the bus, cash fares will not be accepted on London Buses anymore. · Faster boarding enabled, all thanks to the smartcard system implemented in year 2003. · Low floor buses which have fully served London since late 2005 which makes it easier for people with walking difficulties and also enables wheelchair users to use the bus. · Flat fare of £1.50 (2015 price) for all London Bus services with a daily price cap of £4.40. · Buses fully painted red again, yes, an operating requirement from TFL to make all new buses 100% red. · More hybrid buses than any other city in Britain. London currently has over 1,200 hybrid buses, a fraction of them are Hybrid New Routemasters. · The countdown system where bus users can check their phone to see how long their next bus will be, this is also seen at bus stops with their departure boards. Londoners were very lucky that London Buses were never deregulated, although it did come close. Some enthusiasts like competitive tender as it makes it more interesting because it creates more history over private operating companies that operated the individual London Bus Routes. If you want to imagine what deregulated buses are like for a city then take a look at the bus services from Tyne and Wear, Birmingham, Liverpool and Manchester. Over the years it has calmed down for them because the bus operators realise that they are creating losses by providing too many services. There are bus operations which are still owned by the public, most notably Lothian Buses from Scotland which is owned by three councils and Nottingham City Transport which is owned by Nottingham City Council, 5% of their stake is owned privately by Transdev. These are known as Municipal bus companies, there are 12 of them left in Britain. Regulation is starting to grow back, case in point is where Brighton enforced the Low Emission Zone which requires bus operators to have buses with Euro 5 emissions or greater in order to cut emissions and pollution. Tyne and Wear bus services is soon to be controlled back to the Tyne and Wear council under the Quality Contracts scheme. Before London Transport was formed in 1933, LGOC (London General Omnibus Company), who were the first main bus operator back then, started to use route numbers which occurred in the year 1906. Then in 1912, LGOC was brought by Underground Group. Rolling on towards 1924, under the London Traffic Act, the Metropolitan Police were given the authority of allocating route numbers, which all buses had to carry. This is why independent operators used general route numbers, along with suffixes from the alphabet to denote branch routes. If the buses in London were deregulated, the London Bus Executive would have to maintain control over the operators, there would be limited accessibility because the operator would prefer to use second hand buses, just like the private operating companies did outside of London. What is most important to have is regulation to control the emissions of what bus types can operate in the affected areas. I have already written about diesel being toxic but bear in mind that deregulation would be even more dangerous to London in terms of emissions with the pollution levels increasing at double the rate. The main purpose of having a public transport system is to enable people to travel from A to B around the city. If deregulation did happen in London, it would mean that London may be the only major city in the world with deregulated bus services. The operation of London Buses is not the only TFL subsidiary which has been privatised. The operations of London Overground, Docklands Light Railway and Tramlink were also tendered off to private companies as well. Private bus operating companies can form their own routes in Greater London, but they need to get a London Service Permit which has a fee for new applications of £150 including VAT, you can find out more information on that here. The reason I have written this article is because not many people know that London Buses was on the verge of deregulation, so this is important as it is part of London Transport’s history. If my fellow readers could share my article by clicking on the social media button below, I would be grateful. We will improve road transport by: deregulating buses in London and privatising the London Buses subsidiaries. A new London Bus Executive will be responsible for bus- stops, stands and stations and for contracting out socially necessary services. The concessionary fares scheme in London will continue.